Potholes are the bane of drivers everywhere. These huge, gaping pits in roads and parking lots can cause car damage and only get worse if left alone. As with many other big problems, a pothole starts out with the smallest of infiltrations: a little water gets into a crack. The crack widens and lets in more water. Then winter comes and the water under the asphalt freezes and expands. And then the late-winter/early-spring freeze-melt cycle expands and contracts that water, which pushes and pulls on the asphalt, eventually cracking and breaking the asphalt further. And then cars drive over it, knocking off chunks until, voila! A pothole. But we have good news: if you own or manage a large paved area, you can prevent potholes. If you’ve already got potholes, the sooner we repair them, the better. We remove all of the broken chunks, debris, dirt, etc. from the site of the pothole. With a clean surface, the new asphalt patch will adhere more firmly to the older pavement. After cleaning out the area, we heat it up. The heat dries up any excess moisture and also softens the surrounding pavement so that it melds more securely to the new asphalt we put in to patch the hole. We fill the cleaned, heated pothole with fresh hot mix asphalt and compact it down firmly so that it binds with the older pavement for a firm, solid, flat surface that is not susceptible to cracks and leaks. 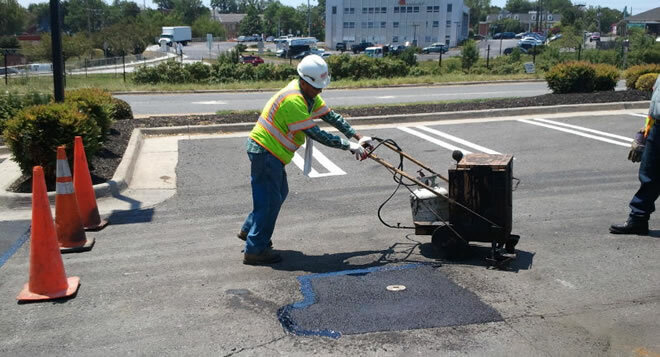 Typically, hot mixed, compacted pothole repairs require only a minimum of curing time. By the time we’ve cleaned up the area, the new asphalt should have cooled off enough to be driven on right away. You typically see a lot of these pothole repair and maintenance jobs going on in the spring, once the weather has warmed up for the season. But Espina Paving can also repair potholes in the winter too, so don’t think you have to wait until spring to get rid of that tire-damaging eyesore in your parking lot. For winter pothole repairs, we use a special asphalt formula called a “cold mix” and it can work on wetter, colder pavement especially well. The great thing about this cold mix is that it actually flexes along with the freeze/thaw cycle so that the pothole stays fixed even in rough-and-tumble weather and traffic conditions. Of course, the most important part of pothole repair and maintenance is prevention. If you don’t have potholes now, you want to do all you can to avoid them in the first place. It’s far less expensive and time consuming to just keep your current pavement looking good and functioning well. Regularly scheduled sealcoating appointments prevent the UV damage, cracks and water infiltration that lead to potholes. Make sure to have this done every 2-3 years, depending on how much traffic and wear your pavement gets. For pothole repair and maintenance, contact Espina Paving today: 703-491-9100.